A villa with a terrace overlooking the Bay of Naples, the bustling atmosphere of Capri's marina, and the elegance of modern interior design: welcome to Villa Vesuvio. The terrace at Villa Vesuvio will take your breath away. 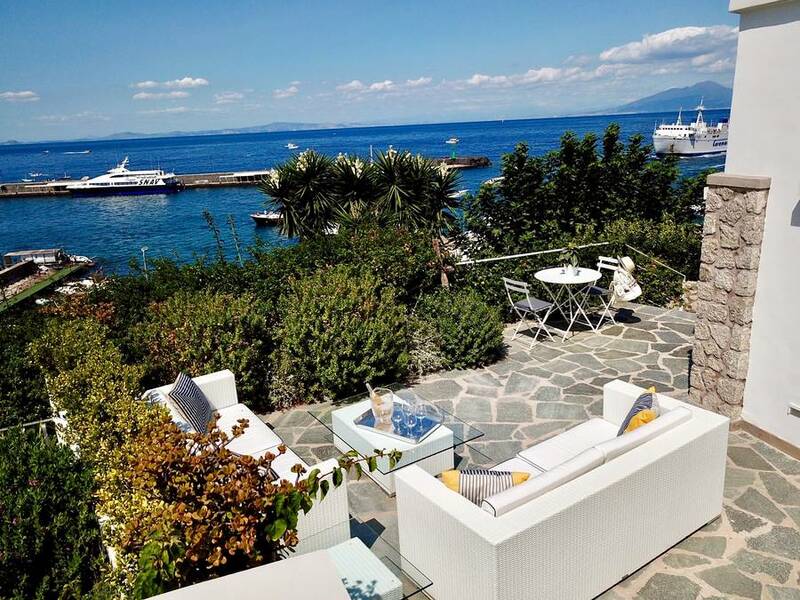 Perched directly above the bustling marina with its constant stream of yachts mooring on Capri and overlooking the Bay of Naples with Mount Vesuvius looming on the horizon, this exclusive spot offers one of the best views on the island. The panoramic terrace is the focal point of the villa, and can be used from dawn to the wee hours of the night. Begin your day with breakfast al fresco, bask in the midday sun on the loungers, and gather for a sunset cocktail or a romantic dinner under the stars. The true highlight of Villa Vesuvio is its interior design. A modern style paired with traditional Mediterranean colors makes the perfect blend, with a careful selection of furnishings, floorings, lighting, and decorative details. The villa has a living room with sofas, satellite TV, and wifi and a dining area. In addition, Villa Vesuvio has two double bedrooms, each with a bathroom with an enclosed shower and courtesy kit by Etro. The villa is part of "Il Fortino di San Francesco", a historic Napoleonic area guard post that has been transformed into a luxury complex including the adjacent Villa Sagittario (for 4 guests) and the Suite Dolce Vita. Together, these three accommodations can be used as a single large villa with three independent units, sleeping a total of 10 guests. Villa Vesuvio is located in Marina Grande, just above the port of Capri. The largest beach on the island is just below the villa, and we can arrange traditional gozzo or luxury speedboat charters for private boat tours! Marina Grande is a charming former fishing village, now home to cafés, gelato shops, a deli, fishmonger, and a number of traditional restaurants. Marina Grande is also well-connected to the center of Capri and the funicular and taxi stand are just steps away, so you can be in the Piazzetta in minutes.